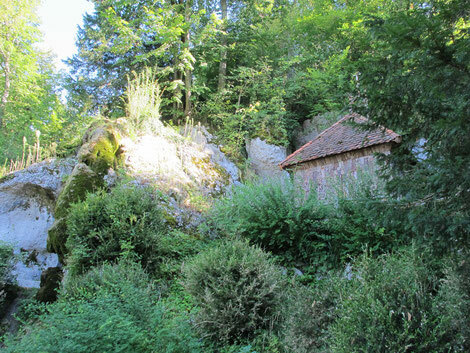 The Hermitage in Arlesheim is the largest English landscape garden in Switzerland. It was started in 1785 as an initiative by the wife of the then prince-bishop's bailiff, Balbina of Andlau, and her cousin, the Canon Heinrich of Ligertz, in Gobenmatttal, a short walk from the center of Arlesheim village. The Hermitage in Arlesheim is, after the Roman city Augusta Raurica, the second largest tourist attraction in Canton Baselland. We retrace the steps of the founders of the Hermitage: Labyrinthine paths lead us to joyful, melancholy or romantic pastoral garden scenes. In addition to the historical backgrounds leading to the conception of the Hermitage we find out how effectively power and energy can be sourced from nature at the Hermitage. This is based on the over 2000 year old Chinese garden tradition which has influenced landscape gardens such as the Hermitage in Arlesheim. Further focal points by arrangement: prehistorical sites, health aspects, vegetation, freemasonry, chinese garden tradition, Feng Shui and more. Length: 2 hours or by arrangement. Good shoes, weather-appropriate clothing. Insurance is left to the participant. By arrangement. Contact us via the contact form.